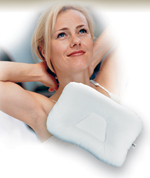 This support pillow is designed to provide help for neck and back pain. The unique contour shape supports your neck in it's most natural position, helping to relieve cervical strain and tension headaches. Using this compact, comfortable cushion while sitting also helps relieve low-back strain. The luxurious satin cover is soft on your face to help your complexion and reduce sleeping wrinkles. Hairstyles are kept in place while providing therapeutic support. Airway blockage, a major cause of snoring, can also be helped. Tension headaches, pain from neck injuries and arthritis are a few conditions that can be helped by proper sleeping posture. The support pillow is constructed of high quality, precision-cut foam to ensure years of comfort and use. The neck pillow measures 14 in x 9 1/2 in with 1 1/2 in and 3 5/8 in lobes. This compact size makes it convenient for travel. Satin covers come in blue, burgundy and white.